This Dark Blue Crystal Rosary is suitable for both men and women and is perfect for daily prayer. This handmade unique Dark Blue Crystal Rosary is inspired from the traditional Catholic Five decade Rosary Design. "Hail Mary" dark blue electroplated crystals are paired with large white "Our Father" porcelain beads, which are hand painted with blue floral design. The porcelain beads are complemented by ornamental Tibet silver, creating a piece that is classic, yet trendy and stylish. Finished off with Madonna and Child silver centerpiece and Fleur-de-lis Crucifix. The rosary is hand wire wrapped with silver plated wire for strength, durability and drape. The necklace part of the Dark Blue Crystal Rosary is approximately 30 inches long. The pendant drop from the centerpiece to the cross bottom is 8 inches long. The Fleur-de-lis Crucifix is approximately 2.25 inches long including the bail. The Fleur-de-lis Cross is a cross adorned with lily petals at the arm-ends. For Christians, the three-pedaled ends represent the Trinity: God the Father, Son and Holy Spirit. Crystal is a powerful gemstone. It is mainly used for amplification of energies. Since crystal stones store energy inside their molecules, some people use them as tools to better connect with spiritual energy while praying. In the Bible, Book of Exodus 39:8-14, God himself instructed people to make a breastplate with 12 different gemstones for a high priest to use in prayer. Blue color represents the sky, heaven (Exodus 24:10) and Holy Spirit. Sometimes blue can mean water, the water of the spirit (John 4:13) or the Lord's commandments (Numbers 15:38). Blue colors symbolize heavenly grace. The Virgin Mary is often depicted wearing blue clothing. Blue also represents hope, good health and the state of servitude. Blue is the liturgical color of Theotokos, Feasts of the Holy Archangels, and Holy Theophany. 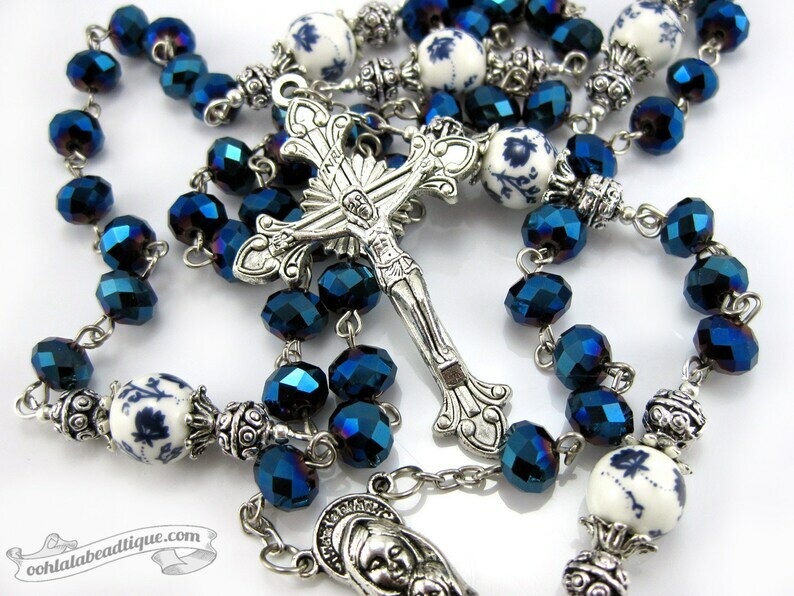 Dark Blue Crystal Rosary will be shipped to you in a padded mailing envelope. Package will include "How to Pray the Rosary" Card. Please have your rosary blessed by your local priest. Many Ooh-la-la Beadtique handmade products are crafted using natural components such as semiprecious stones, freshwater pearls, and wood. No two materials in nature are alike. 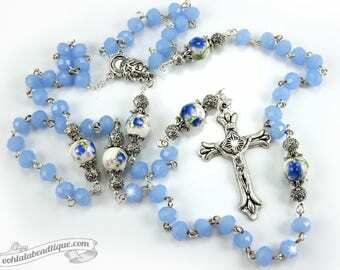 The handmade Dark Blue Crystal Rosary that you will receive may slightly vary in shade and texture pattern from the picture listing. Also note, that all monitors and computer screens are calibrated differently. The same product may appear in diverse colors on different monitors. Item looks even better than the photo. A lot of time effort and craftsmanship went into this item, I love it. I highly recommend buying from this seller.